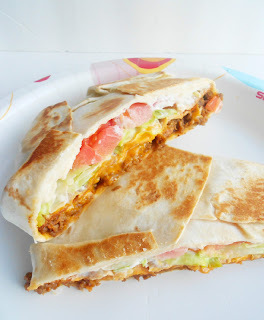 More Sister Stuff: Homemade Taco Bell Crunchwrap Supreme!! This is my FAVORITE thing at Taco Bell...I get it every time i go there! So when I saw this on pinterest I had to make it! And it was SOO good! Probably even better than Taco Bell's because I made it myself. It was a hit...and I will definitely make it again! And it's easy. :) Next time I just need to get bigger tortilla shells so they wrap around the whole thing, You can find it here.